Attending to the grievances of the general public, Chief Minister Kalikho Pul, despite his hectic tour to national capital, conducted the third Public Dharbar at his Official Residence just after arriving from New Delhi which begin at 4:00 PM here today. 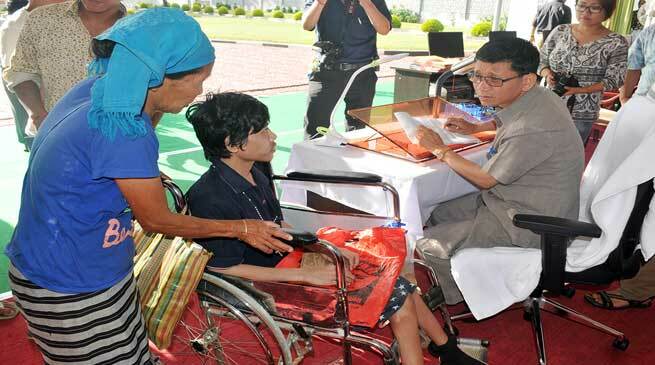 People from various categories viz the disabled, sick, mentally retarded, poor and destitute, etc came to meet the Chief Minister to seek help and assistance from him. This time, more than 100 people from the remote and far flung districts like Kurung Kumey, Dibang Valley, Lower Dibang Valley, KraaDadi, West Siang, Upper Siang, Anjaw, Tirap, Changlang, Upper Subansiri, Lower Subansiri, West Kameng etc also attended the Public Dharbar to submit their grievances before the Chief Minister. Despite the scorching heat, around 800 people including 60 disabled and sick persons waited patiently since morning to get an audience of the Chief Minister Pul who swiftly address their applications and grievances with the support of the CMO staffs.